Crew Energy Inc. (TSX:CR) of Calgary, Alberta (“Crew” or the “Company”) is pleased to announce the completion of a Northeast British Columbia (“NE BC”) Montney petroleum and natural gas rights exchange with the Province of British Columbia (“BC”). Through this transaction, Crew has been granted petroleum and natural gas rights in 53 net sections of Montney land (the “New Acreage”) which is contiguous to the Company’s Groundbirch property, in exchange for the surrender of 66 net sections of the Company’s undeveloped land situated within the Peace Moberly Tract (“PMT”) in NE BC (“the PMT Acreage”). Additional details of the exchange and the map included here are available within Crew’s updated corporate presentation available on our website at www.crewenergy.com. The New Acreage is well positioned within an area that has generated positive results in both the Upper and Lower Montney and is contiguous to Crew’s existing land holdings at Groundbirch. This extensive land base offers access to existing and future infrastructure including Crew’s planned gas processing facility at Groundbirch, the TCPL Nova NW mainline at Saturn, BC as well as the proposed TCPL North Montney Pipeline Project. Since 2004, development on petroleum and natural gas tenure rights within the PMT has been restricted and no petroleum and natural gas tenure rights within the PMT have been made available through the Crown disposition process due to ongoing discussions between the Province of BC and local First Nations. 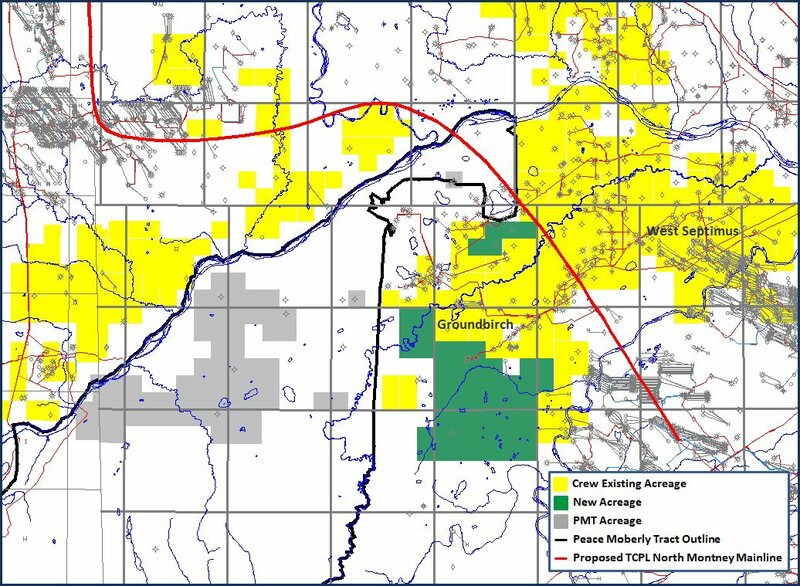 Crew assembled a land position in the PMT as a result of several strategic Montney-focused land acquisitions between 2008 and 2014 and recently entered into discussions with the Province of BC regarding a potential solution to gain access to these lands or the potential for an acreage exchange. Completing this petroleum and natural gas rights exchange enables Crew to consolidate land within one of our strategic Montney operating areas. Crew’s second quarter production exceeded the upper end of our budget averaging approximately 17,600 boe per day based on field estimates. Production for the quarter was impacted by the planned shut-down of the McMahon gas processing facility which took approximately 2,500 boe per day of non-Montney gas production off-line for 25 days. Despite this down time we were able to exceed our budgeted volumes due to better than expected performance from new West Septimus wells that were completed and tested during the quarter. Crew continues to benefit significantly from the dual connectivity of our Septimus gas plant which can simultaneously access both the Spectra and Alliance pipeline systems as constrained natural gas take-away capacity has continued to impact prices and producer volumes in the northeast BC and northwest Alberta region. This dual connectivity has enabled Crew to capture the best available pricing option for our NE BC gas. Over the last three quarters, Crew has realized a net benefit of approximately $6.8 million from term fixed differential sales and a net benefit of over $2 million due to our ability to divert gas to multiple pipelines. Crew remains in a strong position, with a current inventory of 30 Montney wells drilled, 22 of which are in various stages of completion and tie-in. We currently have two drilling rigs working with one drilling the fourth well on a five well pad at West Septimus and the other drilling the third well of a five well pad at Septimus. At West Septimus the drilling results have progressively improved with the latest subset of wells exhibiting significantly higher than forecasted gas flow rates, condensate rates and pressures. On the most recent six well pad in West Septimus, the first three wells drilled have tested significantly higher than our initial wells at West Septimus and demonstrated an average per well rate of 7.8 mmcf per day, 586 bbls per day of condensate (75/bbls per mmcf) with an average flowing casing pressure of 1,740 psi following a five day flow period. Our previous West Septimus wells were assigned average proved plus probable reserves in our year end 2014 independent reserve evaluation of 2.8 Bcf of natural gas and 83 mbbls of natural gas liquids (59% condensate), which was based on an initial production rate of 2.5 mmcf per day with 17 bbls per mmcf of condensate. We expect to communicate flow test data from all six wells on this pad by the release of our second quarter results on August 6th, 2015. Given these recent well results we believe there is significant upside potential to outperform the ultimate recoveries assigned at West Septimus in the 2014 reserve evaluation. Drilling and completion optimization and an improving cost structure have helped reduce per well costs to between $4.0 to $4.5 million, which when combined with higher gas and condensate rates has resulted in much improved capital efficiencies at current commodity prices compared to our historical Septimus wells. Throughout the second quarter Crew has remained active finalizing the construction of our new 60 mmcf per day West Septimus processing facility, which remains on schedule with final testing to be completed in July followed by commissioning in the first half of August 2015. With our highly successful drilling program at West Septimus Crew is evaluating the merits of expanding this facility to 120 mmcf per day. The Company has also begun the installation of the new condensate pipeline connection at our Septimus facility which is planned for completion concurrent with the commissioning of the new West Septimus facility. This small but critical infrastructure project will eliminate the trucking of condensate from the Septimus area resulting in an anticipated increase in the area’s condensate netbacks by $3 to $4 per barrel. Crew’s 2015 exploration and development capital expenditure budget remains at $185 million, which is net of the recovery of 50% of the cost of the West Septimus plant construction from Crew’s infrastructure partner. Our annual average production guidance remains at 20,000 to 22,000 boe per day. Our year-end exit production forecast remains at 24,000 to 25,000 boe per day, which is approximately 29% higher than our first quarter 2015 volumes, as a result of an estimated 6,000 boe per day of incremental production coming on-stream with the new facility being commissioned in the third quarter. The Company looks forward to reporting our second quarter financial and operating results after market close on Thursday, August 6, 2015. This news release contains certain forward-looking information and statements within the meaning of applicable securities laws. The use of any of the words “expect”, “anticipate”, “continue”, “estimate”, “may”, “will”, “project”, “should”, “believe”, “plans”, “intends” “forecast” and similar expressions are intended to identify forward-looking information or statements. In particular, but without limiting the foregoing, this news release contains forward-looking information and statements pertaining to the following: the anticipated benefits of the Montney petroleum and natural gas rights exchange transaction and prospectivity of the New Acreage; the volume and product mix of Crew’s oil and gas production; production estimates including 2015 forecast average and exit productions; future oil and natural gas prices and Crew’s commodity risk management programs; future liquidity and financial capacity; future results from operations and operating metrics; potential reserve and recovery upside at West Septimus; anticipated reductions in operating costs; anticipated increase in the Septimus area’s condensate netbacks; future costs, expenses and royalty rates; future interest costs; the exchange rate between the $US and $Cdn; future development, exploration, acquisition and development activities and related capital expenditures and the timing thereof; the number of wells to be drilled, completed and tied-in and the timing thereof; the amount and timing of capital projects including anticipated timing of the commissioning of the new West Septimus facility, potential expansion thereof and installation of pipeline connection at our Septimus facility; the total future capital associated with development of reserves and resources; and methods of funding our capital program, including possible non-core asset divestitures and asset swaps. Forward-looking statements or information are based on a number of material factors, expectations or assumptions of Crew which have been used to develop such statements and information but which may prove to be incorrect. Although Crew believes that the expectations reflected in such forward-looking statements or information are reasonable, undue reliance should not be placed on forward-looking statements because Crew can give no assurance that such expectations will prove to be correct. In addition to other factors and assumptions which may be identified herein, assumptions have been made regarding, among other things: the impact of increasing competition; the general stability of the economic and political environment in which Crew operates; the timely receipt of any required regulatory approvals; the ability of Crew to obtain qualified staff, equipment and services in a timely and cost efficient manner; drilling results; the ability of the operator of the projects in which Crew has an interest in to operate the field in a safe, efficient and effective manner; the ability of Crew to obtain financing on acceptable terms and the adequacy of cash flow to fund its planned expenditures; field production rates and decline rates; the ability to replace and expand oil and natural gas reserves through acquisition, development and exploration; the timing and cost of pipeline, storage and facility construction and expansion and the ability of Crew to secure adequate product transportation; future commodity prices; currency, exchange and interest rates; regulatory framework regarding royalties, taxes and environmental matters in the jurisdictions in which Crew operates; the ability of Crew to successfully market its oil and natural gas products.